Maintaining the trees on your land is a necessary part of being a property owner. There are three main reasons why you should routinely have your trees trimmed: safety, health, and aesthetics. Safety is the most important reason why you should maintain the trees in your yard. Dead branches can fall at any time, harming power lines, cars, or even buildings. Trimming branches and limbs ensures that trees stay healthy. Lastly, trimming and pruning trees allows you to maintain your property’s appearance. In some cases, trees have to be removed due to disease, storm damage, or land development and construction purposes. You should never attempt to remove trees yourself. It can be dangerous and should only be done by professionals using the proper equipment. 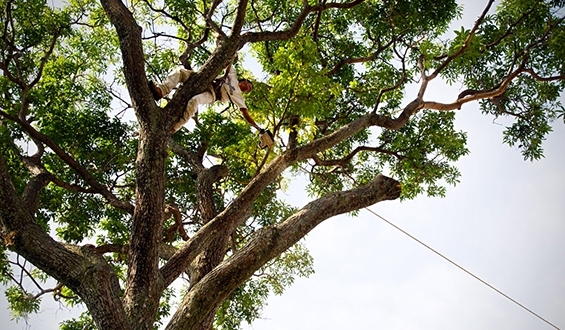 For the best and safest results, tree trimming and removal requires agricultural knowledge and training and should only be done by trained experts. Our team is experienced, knowledgeable, and has the latest equipment in order to meet all of your tree trimming and removal needs. Don’t get stumped. Tree stumps in your yard can be an eyesore, or even a safety hazard, especially if you have little ones running around the yard. 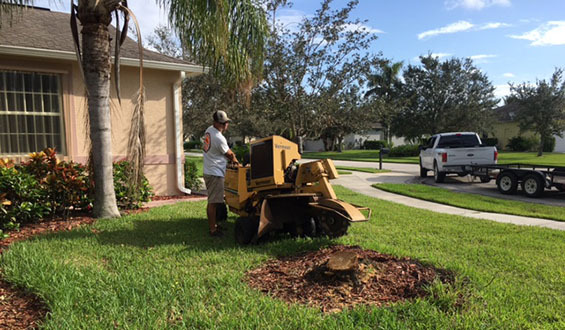 Removing stumps on your property can be a difficult task, but Jack’s Complete Tree Service has state-of-the-art stump grinders for efficient stump grinding and removal. Our machines remove stumps easily by chopping the roots into small chips. You can leave the mulch for gardening purposes, or you can opt to have it covered in sod. Palm trimming requires specific knowledge and technique due to the unique way that palm trees grow. Palm trees are monocots, which means they don’t grow outward the way most trees do. Palm trees grow one frond at a time, which means that if they aren’t pruned properly, the tree can die. Palm trimming is not difficult, but it is often done incorrectly. 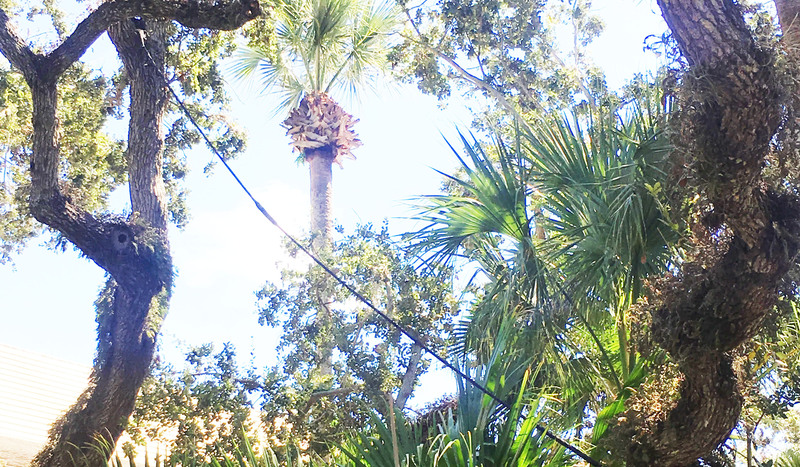 It is rare that live fronds need to be removed unless they are obstructing power lines or other objects on the property. 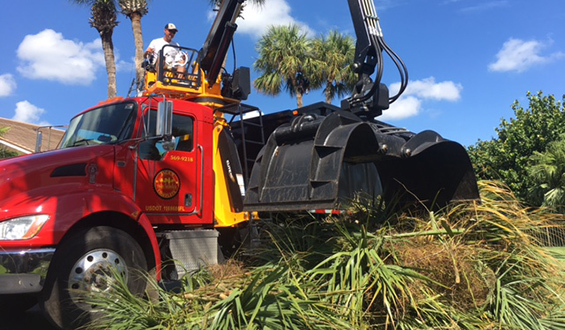 Jack’s Complete Tree Service will remove only the palm fronds necessary and any fruit that could fall and cause property damage. 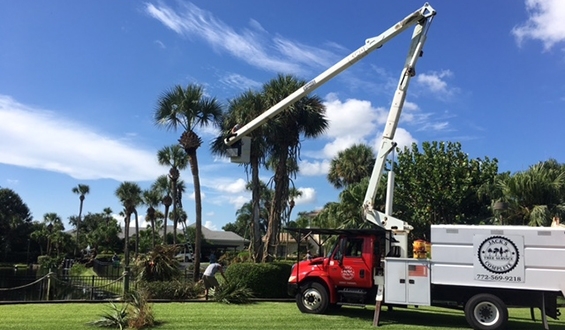 We know how to take care of all types of Florida palm trees, including Sabal Palms, Coconut Palms, Queen Palms, Royal Palms, Medjool Palms, Canary Island Date Palms, Bismark Palms, Date Palms, and Washingtonia Palms. The saying “a chain is only as strong as its weakest link” can also be said for trees. In some cases, trees need extra support, and that’s where cables and brace rods come in. These structural support systems reduce the risk of failure of multiple stems and weak branches. Each circumstance is unique and requires professional expertise. One of our specialists can properly diagnose the best course of action for each tree. Some cases require cables, consisting of maximum-strength steel attached to bolts that we install in the upper crown of the tree. Cables limit the movement of the supported branches, making them less likely to fall during a storm. Braces are threaded rods that we install through unions of weak branches or multiple stems to ensure a sturdier support system for the tree and its branches in intense weather conditions. Whether you want to relocate a tree on your property, or you are undergoing the process of landscaping and adding new trees from a nursery, we can help. 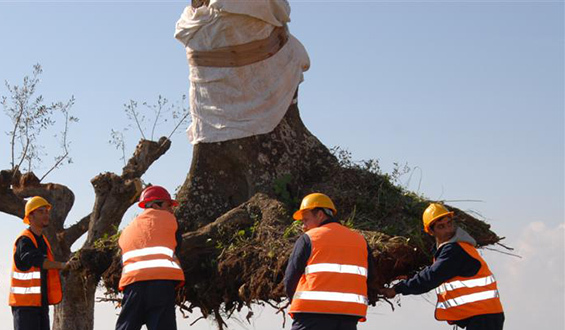 We take into account the health of the tree you want to move and assess whether or not it is safe to do so. Using top-of-the-line equipment, we dig out the new location and use a spade truck to lift the tree from its current location. If need be, we will transport the tree to its new location, and then lower it into the hole. After the tree is in place, our crew will ensure the tree’s health by adding new soil and deeply watering the tree. Florida has the highest frequency of lightning storms out of all 50 states. It is possible for lightning to kill trees instantly, and it has the ability to weaken them so significantly that they are left susceptible to insects and other harmful elements. Lightning can also affect structures near a tree that is struck. When lightning hits a tree, it can then jump to adjacent, more conductive material such as downspouts and other metal objects. If a house is within ten feet of a tree that is taller than its roof, the structure is highly susceptible to such lightning “jumps” or side-flashes. 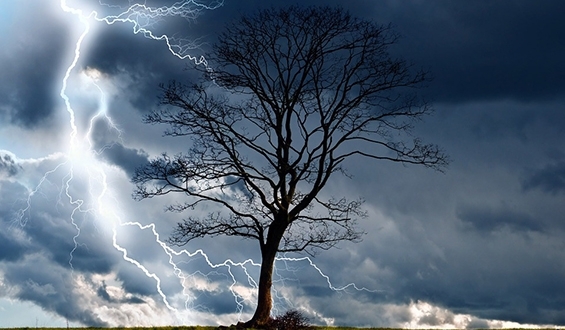 Jack’s Complete Tree Service can offer you protection and peace of mind by installing lightning protection systems that minimize the risk of lightning damage. Copper conductors are connected to a ground rod to help disperse the electrical charge away from the tree and into the earth. This greatly reduces the damage to a tree that is struck and reduces the risk of side-flash. Hurricanes and tropical storms cause destruction to your property. Hurricane force winds and oversaturated soil can cause roots to fail and branches to weaken. It’s important to prepare for these conditions in advance to help reduce the risk of damage. To be safe, you can have our specialist evaluate your property and perform the maintenance necessary to keep storm damage to a minimum before hurricane season hits, June 1st through November 30th. 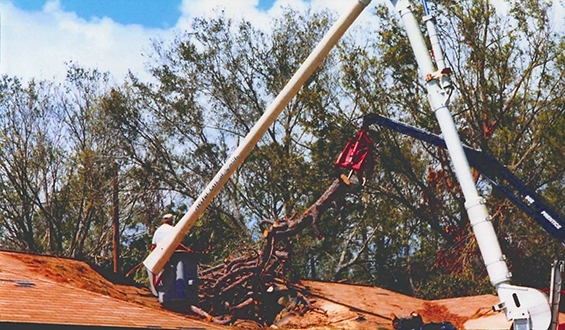 Proper tree trimming reduces the risk of hurricane force winds blowing over trees and branches that can cause damage to your property. Keeping a properly maintained yard can save you time, money, and stress before and after a hurricane hits. We will assess the structure of the trees on your property and ensure they are in the best condition possible in order to weather the storms to come. After a hurricane, we will be there to help. Our crew can help remove fallen trees or branches in your yard or obstructing driveways and roads. Once we have removed and hauled all of the debris away, we will assess any damage that the storm may have caused to trees on your property. It is possible that trees damaged in a storm will need bracing or even removal. Jack’s Complete Tree Service has a fleet of trucks that make it easy for us to efficiently remove agricultural debris from your property. Whether we have been working on your property, or you have worked on your own and now need someone to help clean up, you can trust that we will remove all of the debris, including leaves, grass clippings, fence clearing, brush, weeds and vines, tree branches, and wood chips. 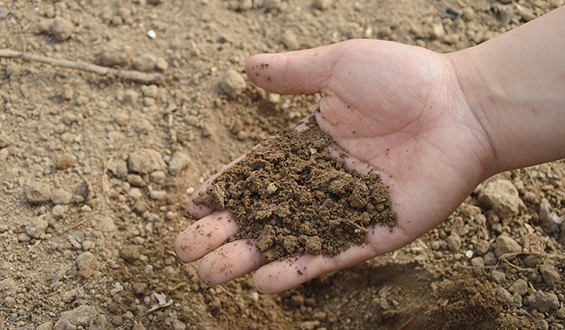 If you want healthy trees and plants, you need healthy soil. Fertilization and soil analysis are important parts of ensuring the health of the trees on your property.  Jack’s Complete Tree service can balance the pH levels in the soil on your land and use an advanced root injection system to transform the soil for the optimal health of your trees. We provide a variety of fertilizers and create a blend that’s uniquely suited for the trees on your property. Different species of trees have different needs, and when you combine that factor with the specific makeup of the soil currently on your property, it makes it critical that we evaluate every situation and customize our treatments to give your yard just the right the boost it requires.